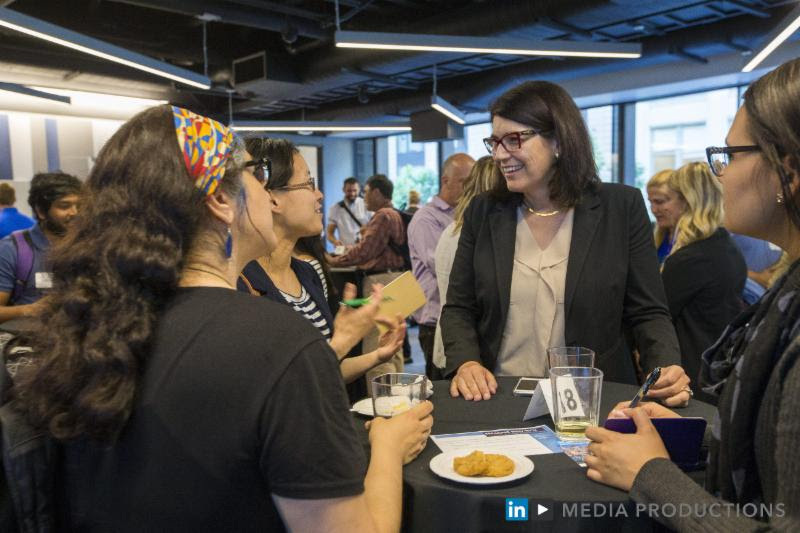 On June 21st, over 200 coding school graduates, nonprofit employees, seasoned tech workers, and everyone in between gathered at LinkedIn for the latest sf.citi One City Forum event: Breaking Into Tech Speed Networking. Job seekers came armed with resumes and elevator pitches, while advisors from tech companies throughout the city brought their finest gems of career advice. After a brief introduction by LinkedIn Director of Community Affairs Katie Ferrick and sf.citi Executive Director Jennifer Stojkovic, attendees divided into small groups. Over the next hour, job seekers moved from table to table, exchanging questions and insight with at least five employees from sf.citi member companies. They also had the chance to receive lightening resume reviews from representatives with HireClub, a job career coaching platform. Closing the event, Executive Director of Larkin Street Youth Services and One City Forum co-chair Sherilyn Adams applauded the spirit of collaboration that made the evening a success for both tech advisors and attendees looking to learn more about San Francisco’s tech industry. LinkedIn Director of Community Affairs Katie Ferrick advises job seekers at Breaking Into Tech. What motivated our advisors to participate in Breaking Into Tech? 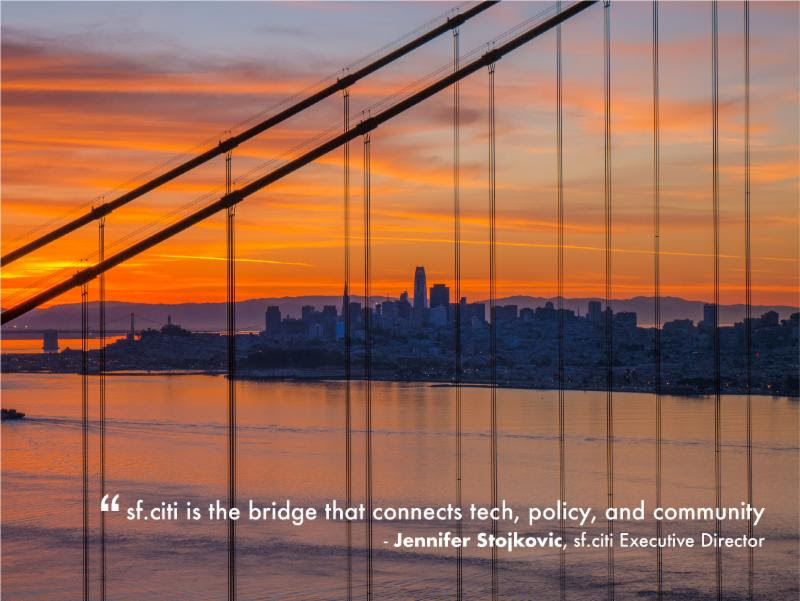 sf.citi is thrilled to announce the launch of an official sf.citi blog to serve as your one-stop-shop for the latest sf.citi insights on tech stories, news, and policy in San Francisco. To inaugurate this special moment in sf.citi history, we have two exciting pieces that provide a closer look at how sf.citi started and where we’re heading in the future. The Managed by Q team discusses internship opportunities with this year’s Future Grads. sf.citi and the San Francisco Police Foundation welcomed a new cohort of summer interns at the seventh annual Future Grads kick-off on June 18th. For the next two months, our Future Grads participants from high schools throughout the city will intern at sf.citi member companies like AdRoll, Meadow, and Managed by Q, as well as our non-profit partners such as Techtonica, the Job Forum, and the Architectural Foundation of San Francisco. Future Grads always proves to be an enriching experience for both our interns and the employees at our member companies who work with them. This year, to give you a better idea of what our Future Grads learn from their experience, sf.citi will be featuring student-authored blogs over the course of the program – stay tuned! If you would like to host future Future Grads (excuse the repetition), become an sf.citi member today!